In our March/April issue, Daniel Leffler, M.D. of the Celiac Center at Beth Israel Deaconess Medical Center, wrote about next week’s GREAT3 workshop and it’s importance to those who have celiac disease. The celiac disease workshop is sponsored by the Food and Drug Administration and a group of associations working on gastroenterological diseases. “It’s not often that scientists, government regulators, pharmaceutical companies and patients get together to talk about advances in the treatment of celiac disease,” Leffler wrote in describing what the meeting is about. The portion of the workshop devoted to celiac disease will be held on Tuesday and will examine how clinical trials for drugs related to celiac diseae can best move forward. A who’s who of celiac disease experts will speak, including physicians and researchers Joseph Murray, Alessio Fasano, Sheila Crowe, Ivor Hill, Stefano Guandalini, Peter Green, Benjamin Lebwohl and Leffler. Alice Bast, head of the National Foundation for Celiac Awareness, will present the patient’s perspective.”For the first time, the FDA is coming together to talk about the remaining unmet medical needs of the community. 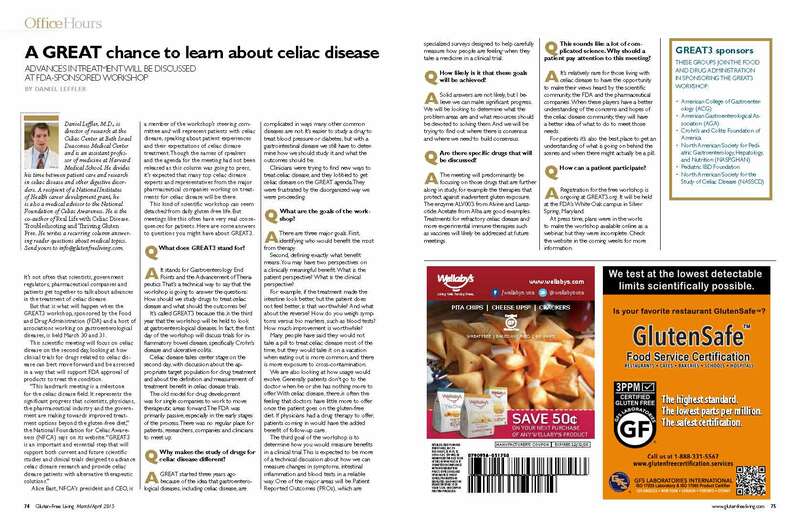 This means that celiac disease is being recognized as the serious genetic autoimmune disease that it is, not the passing fad diet or food allergy that it is commonly made out to be,” NFCA says on its website. The meeting is being held on the FDA campus in Silver Spring, Maryland, but even if you are far away you can follow developments through remote access by computer or phone. Both visual and audio will be provided via the webcast. Remote users participating in the webcast do NOT need to call in to the phone line for audio access. You can find the full agenda for the meeting here. If you are wondering what you, as a celiac disease patient, can get out of tuning into the workshop, here’s Leffler’s answer. “For patients, it’s the best place to get an understanding of what is going on behind the scenes and when there might actually be a pill (to treat celiac disease). If you can’t tune in, go to Gluten-Free Living’s facebook and Twitter pages for updates from the workshop.